Yep, you know we’ve all thought it...you know that feeling when you have to decide whether or not to wake up early and you think to yourself, which is better? Is it worth it to just go workout as soon as I wake up? Or should I leave it for when I have more energy in the afternoon? Should I sleep in a little longer? What if something comes up and then I don’t make it out in the PM? Etc, etc, etc. Well, This week I start BBG stronger! (Yay - so excited to try Kayla’s new program!!) But, I’m caught up with the dilemma of when would be best to complete my workouts. You see, I had taken a break from Kayla Itsine’s BBG programs and was honestly debating whether or not to do another round (Now don’t get me wrong, I LOVE BBG and I can’t preach it’s awesomeness enough since it’s always a good sweat and effective workout, but as of March I needed a change so I stopped doing BBG and started trying new fitness studios and workouts around L.A.) Fast forward to almost three months now, and I’ve been missing and craving the consistency I felt completing BBG. So, you can imagine my excitement when Kayla released the new addition to her SWEAT app #BBGStronger; I had to jump on the BBG wagon ASAP! 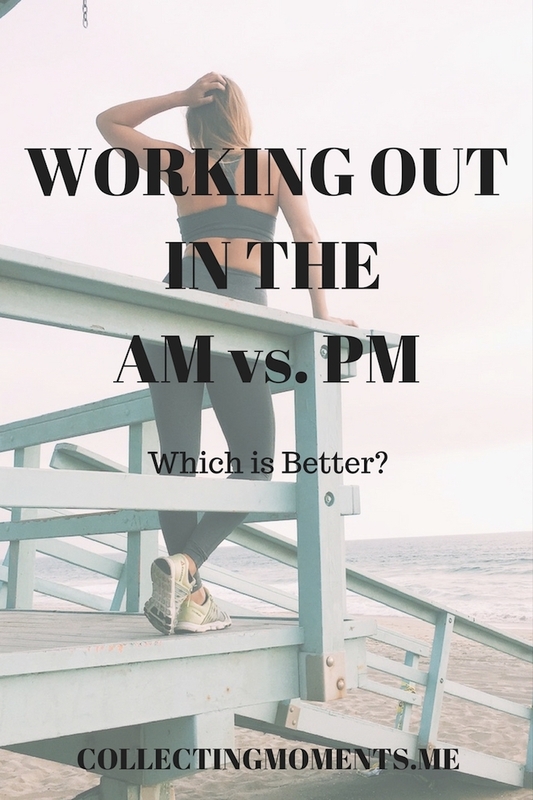 BUT, I’m caught with the dilemma on when to workout and complete my BBG stronger sessions, What’s the best time to do them? Which will give me better results? So, I decided to do a little research of AM vs. PM advantages. Friendly reminder: Choosing when to workout and when to benefit the most from it is truly a person by person case as we all lead different lifestyles, work schedules and have completely different bodies and energy levels. The most important thing is to ALWAYS listen to your body, your mind and go from there. Be intuitive! I have the privilege and advantage of being able to fit my workouts in either slot (AM or PM), so based on this, I decided to do a quick, simple and generic list based on what I find to be true overall. 1) Mission Accomplished - Yes, it’s that simple! Getting your workout done in the early morning means you don’t have to worry about it any longer throughout the day. No more feeling guilty if something comes up later that day and you don’t make it out to the gym, studio or class. Also, depending on whether or not you’re a morning person, you may have some trouble getting up, but once you’ve completed your workout your endorphins will kick in and you’ll start your morning with a happy and positive energy. 2) Consistency - Getting it done in the morning makes it more likely to convert it into a long-term habit because you have complete control over it. (Yes, you might think you have control over it in the afternoon, but think how much can happen in a day? What if a last minute meeting at work goes on longer? Or you get sick?) In the morning, all you have to think about is getting up and getting it done, which in return makes it a constant in your life. Plus, you'll not only feel great for having worked out, you’ll also feel a sense of pride and fulfillment for being in line with your goals of a healthier and better you. 3) Healthier choices - I think this applies to every time we work out because after putting in the work and effort, you become more conscious of how to nourish and replenish your body in the best way possible. Thus working out in the morning incites you to make healthier choices right from the get go (i.e breakfast) and hopefully throughout the rest of your day. 5) Sleep - Lastly, another great benefit of sweating it out in the morning is you’re more likely to go to bed early knowing you have to get up early, which means you’ll get a better night’s sleep! This can lead to sleeping more hours as you become a consistent early morning rooster. Remember, sleeping is such an essential part of a healthy lifestyle as it’s the time we honor our bodies and let them rest and rejuvenate to better serve us throughout our busy lives. 1) More energy - One HUGE benefit of working out in the afternoon is you have more energy to complete your training sessions. Think about it, after having spent all day fueling your body, you have more energy and thus more strength to complete a workout. Depending on what kind of training you’re doing, this may be a huge factor to take into consideration. 3) Convenience - A big reality is that a lot of us need to workout after work or in the afternoon because it’s just easier. Maybe your gym is close to work and so it’s easier to go right after, or you have other chores to do in the morning such as getting your kids ready for school or even the classes you want to attend are not offered in the morning before work. That’s okay! Make it easy on yourself, if it’s simply more convenient to go in the PM, do so and don’t worry about it. The whole point is finding a time that will make you stress less and thus make working out a part of your lifestyle and not a chore. 4) Accountability - Knowing there are so many obstacles that may impede you from going in the afternoon, and actually following through and still finding that time to workout gives you a sense of accountability which after completing your workout turns into a sense of pride! Plus, it’s easier to find an accountability buddy or someone willing to go train with you in the afternoon! 5) Disconnect - Working out in the PM is a huge stress reliever - no matter which type of workout you’re into, normally once you start your training sessions, that’s all you think about- the present and getting that next move correctly. Then before you know it, you’ve disconnected from anything that has happened throughout your day. Once again, there’s no right or wrong answer for when to work out and it truly depends on your lifestyle. But, after looking at this list, be honest with yourself and see which you will truly be able to maintain long-term thus providing better results.